It looks like cracks are starting to show in the once-booming property market at Iskandar Malaysia. UEM Sunrise Bhd, considered a bellwether to Iskandar, last week slashed its sales target for 2014 to RM2billion ($792 million) from RM3.2 billion, citing weakness in the market for homes in the economic corridor south of Johor. This comes as a slew of high-rise apartments - many of them from the Chinadevelopers, and many of them on the waterfront - are set to flood the market. And things could get worse before they get better. It is believed that about half of the condominiums in Country Garden Danga Bay, which last year rolled out a record 9,000 high-rise units, have remained unsold, and the Guangdong-based property giant is now looking increasingly desperate to unload its stock by either hiking discounts of dropping prices, although the exact quantum is unknown. The Danga Bay project was launched with much fanfare last year at an average of RM900psf. 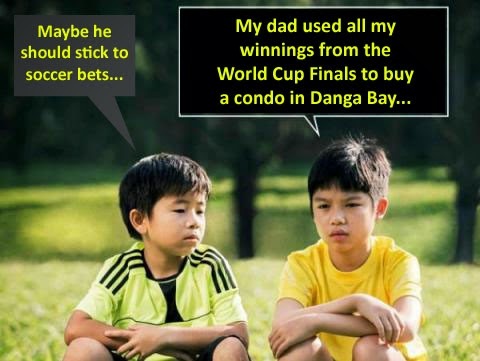 Most of the real estate firms in Johor Baru have been roped in to sell homes for Country Garden Danga Bay, and it is dangling commissions of up to 8% versus the typical 2 - 3% as an added incentive. In fact, according to an agent, three people were spotted carrying sandwich boards near a bank in Johor Baru last month advertising units in Country Garden Danga Bay. It is not clear who they were representing, but property executives speculate they could be acting for Country Garden's foreign buyers. Checks with agents reveal that the Phase 2 units are going for the same price for all floors, a departure from the usual practice of pricing the topmost levels at a premium. Buyers can opt for the promotion price, which in some instances adds up to a 40% discount, provided they pay for the property in cash over several transactions. Doing so will shave RM300,000 off the price of a single-room unit measuring between 400 to 500sqft, which would normally cost RM800,000. Country Garden hasn't raised its maximum discount beyond 21% since launch day, say agents familiar with the matter, but it may not be long before the company has to dump prices. Right next door, China's state-owned Greenland Group will soon launch 2,478 units of apartments and townhouses. Also, R&F's Princess Cove project will introduce about 3,000 units of apartments in the first phase and another 30,000-plus units thereafter. "There are also a few other projects in the Danga Bay area being prepared for similar types of developments," he said. The problem here is clearly one of mismatch between demand and supply. Demand remains strong for affordable homes costing below RM400,000, yet much of the new supply is heavily skewed towards high-rises. Records have indicated that slightly more than 100 high-rise projects scattered throughout Johor Baru and Iskandar Malaysia, comprising a little over 100,000 units, are expected to come onstream in the next few years. One-third of that is within the R&F site, and another 10% within known projects at DungaBay, where CountryGarden and Greenlandare based. The proposed Forest City at the Second Link in Nusajaya is another huge project on the horizon. All that has led to a visible slowdown over the past 10 months. Many investors, particularly foreigners appear to be adopting a wait-and-see attitude. This is not helped by the changing policies and price threshold limits. Sentiments could get worse in 2015-16, when a large number of the high-rises sold during 2012 and 2013 are handed over. The problem may be especially acute in hot spots such as Nusajaya, Medini and Danga Bay. Looks like Iskandar Malaysiais going to be raining condos come 2015-16, much like what is expected in Singapore. And the blood-letting by China developers seemed to have begun even earlier than what the wife and I had predicted before (refer to our previous blog posts below). And if our rusty memories served us right, GIC had recently announced that they will enter into the fray to invest in residential projects in Iskandar Malaysia. Maybe they know something that we don't but that decision may warrant a re-think. Then again, we are mere laymen while GIC are run by ... professionals. What Iskandar really need is not more "Star Power" (aka Mainland Chinese actress Tang Wei and some of our own Mediacorp artistes), rather the army of Mainland Chinese buyers/ investors that the China developers have been saying will come to snap up homes in Danga Bayand the likes soon. No Comment to " Start of the GIS (Great Iskandar Sell-off)..? "